This paper outlines how one can use activity theory (AT) as an analytical framework to understand tool use and its attendant developmental impact in context by selecting object-oriented activity as the unit of analysis. While an understanding of object-oriented activity is central to activity theory, the notion of object is a frequently debated and often misunderstood one. The conceptual confusion surrounding the object arises both from difficulties related to translating the original Russian conceptualisation of object-oriented activity into English as well as from the different interpretations of the object currently in use within two contemporary approaches in activity theory. Further compounding the understanding of this notion as it relates to pedagogical practices within schools is its use as a predominantly interventionist tool in work settings to understand transformation rather than as a theory to explain activity in classroom settings. This paper sets out to develop a methodology for studying the object of mathematics lessons by exploring notions of object-oriented activity, before discussing the conceptual challenges arising from its use in two contemporary versions of activity theory. To this end, the paper traces the historical development of the object through Leontiev (1975/78; 1981) and Engeström's (1987) expansion of Vygotsky's original triadic understanding of object-oriented activity. The paper goes on to elaborate a methodology for using AT to analyse observational data by developing the notion of evaluative episodes as pedagogical events in which the pedagogical object is made visible in computer-based mathematics classrooms. Findings indicate that an evaluative episode can serve as a moment in which the dynamism of an activity system is momentarily frozen, enabling one to model human activity in the system under investigation and, hence, in this study, to understand learning in context. Keywords: activity theory; learning with computers; evaluative episodes; object-oriented activity. Computer-assisted teaching and learning has come to occupy a significant role in classrooms around the world, with positive learning outcomes being reported by various researchers (Sivin-Kachala, 1998; Holmes, Savage &Tangney, 2000). This is especially true in relation to the use of this technology to teach mathematics (Papert, 1980; 1990; Campbell et al, 1991). Research into mathematics classrooms shows that computer technology can support problem solving skills (Fey, 1992); decrease the amount of time required to master skills, allowing for more time to be spent on developing conceptual understanding (Wagner & Parcker, 1993) and facilitate the development of deeper understanding of algebraic ideas (Kaput, 1992). As South Africa currently faces a crisis in mathematics education, which has seen it placed last1 in the Third International Mathematics and Science Study (Martin et al, 2000), if computers are indeed able to impact positively on mathematical performance then placing this new technology into schools could help alleviate the deepening crisis. The assumption underlying the implementation of computer-based technology into schools in South Africa is that the technology will help to develop autonomous learners, who are both mathematically and technologically literate (DoE, 1996; 2000). And indeed it would appear, given the right circumstances, that the computer can facilitate the development of autonomous learners capable of exploring their world and constructing knowledge (Wegerif, Mercer, & Dawes, 1999; Wegerif, & Scrimshaw, 1997; Mercer, & Wegerif, 1998). While policy documents (DoE, 2002) point to the desired outcomes of the current curriculum (such as 'qualified, competent, dedicated and caring' teachers and 'confident and independent, literate, numerate, multi-skilled, compassionate...' lifelong learners who are active citizens (DoE, 2002:3), there is little indication about what must be transformed in order to meet these outcomes. One thing, however, seems clear and that is the need to develop mathematically literate students who are capable of engaging in the global marketplace. The use of computers as teaching/learning tools offers at least the hope of meeting this outcome (Hardman, 2004). This paper emerges out of a wider investigation aimed at understanding how teachers use computers to teach mathematics at a primary school level in four previously disadvantaged schools in the Western Cape, South Africa. Much research conducted in the past in information and communication technology (ICT) and teaching/learning focused on the interaction between an individual child (or in some cases a group of children) and the computer; the underlying assumption is that learning emerges only out of this interaction. However, present research (see for example Nardi, 1996) indicates that learning with ICTs needs to be understood in relation to broader social relationships and structures that afford and constrain the interaction between the student and the computer. For those researchers working to understand how computers potentially impact on or mediate learning, activity theory (AT) provides a powerful analytical framework for situating learning in context (Hardman, 2005c; Lim & Hang, 2003; Lim, 2002; Lim & Chai, 2004; Nardi, 1996; Kuutti, 1996; Bottino et al, 1999). Figure 1 represents a contemporary view of an activity system, which activity theorists take as the prime unit of analysis (Engeström, Miettinen & Punamaki, 1999; Engeström, 1987). This unit of analysis allows one to situate developmental processes in context. What one can see from figure 1 is that the subject acts on the object in order to transform it using mediating artefacts in order to arrive at an outcome. In turn, the subject's position and engagement with the activity is influenced by the rules of the context, his/her community and division of labour. A key characteristic of an activity system is its object orientedness (Leontiev, 1981; Engeström, 1987; Hardman, 2007a; Foot, 2002). Objects define activities and, hence, identification of the object of the activity enables one to map the different nodes of the activity system. However, tracking the object of an activity is a problematic endeavour due in part to the different views on how the object can be defined. This paper seeks to illustrate a method for investigating the object of mathematics lessons using activity theory by focusing on analytical events that I call evaluative episodes as spaces in the data that surface the object of an activity. Human activity is collective and human behaviour originates within the social realm (Cole & Engeström, 1993). Mind is social, growing out of joint activity. Tools, which carry socio-historical meanings, mediate our psychology. Activity theory studies development and change, which is understood to include historical change, individual development and moment-to-moment change (Russell, 2002). Activity theory assumes that people are active cognising agents but that they act in sites that are not necessarily of their choosing with tools that constrain and afford their actions. Methodologically, activity theory rejects cause and effect explanatory science in favour of 'a science that emphasises the emergent nature of mind in activity and acknowledges a central role for interpretation in its explanatory framework' (Cole, 1996:104). Consequently, activity theorists make use of a contextualist methodology. Activity systems are constantly subject to change and activity theory sees these changes as driven by contradictions (Engeström, 1987; Russell, 2002). While providing a rich framework for investigating the subject-in-action, activity theory is not particularly well developed when it comes to studying the complexities of classroom interaction. Further, the theory is hampered in part because the notion of 'object' is not sufficiently well operationalised to investigate its emergence at the level of the classroom. While there are numerous examples of the application of activity theory in interventionist research to analyse work (Engeström, 2001); product design (Hyysalo, 2005); collaborative activity (Nardi, 2005); studies in creativity (Daniels & Ledbetter, 2005); drama games with children (Brostrom, 1999); educational interventions (Lim & Hang, 2003; Seitamaa-Hakkarainen, Hakkarainen, Bollstrom-Huttunen, Engeström, 2005) and even the workings of a law court (Engeström, 1997), there are surprisingly few analyses dealing with the use of activity theory in exploratory studies at the level of the primary school classroom (see Lim & Hang, (2003) for a notable exception)2. Further, as it is used primarily as an interventionist tool, AT struggles to track the emerging object of complex activity systems observationally. There is nothing, however, in the AT literature to suggest that it is problematic to rely on observations to uncover the object of an activity. In fact Engeström & Escalante (1996) suggest that the objects of manual labour, for example, are relatively easily discerned due to their observable materiality. The point, however, is that it becomes increasingly difficult to track an object in a complex activity system, such as a school, unless one intervenes to disrupt practice, thereby forcibly making visible the previously invisible object. In this paper I argue that AT can be used as a framework to study the object of classroom activity observationally in the absence of an intervention. My argument hinges on the notion of what I will call evaluative episodes, analytical spaces that surface the previously invisible pedagogical object. In the absence of direct intervention, how can one uncover the object of activity in computer-based primary school mathematics classrooms? What does the activity system of a grade 6 computer-based mathematics lesson look like? Reacting against the two dominant theoretical paradigms of his day (behaviourism and introspection), Vygotsky's general genetic3 law of human functioning and his notion of mediation transcended the nature/nurture debate by illustrating how higher cognitive functions develop in context. His classic triadic model (figure 2) shows how higher cognitive functions are mediated by tools while elementary functioning occurs at the base of the triangle. While Vygotsky's learning theory points the way towards an understanding of learning as distributed, it does not develop an analytical framework capable of situating learning within a wider context, accounting for the collective and dynamic nature of activities (Engeström, 1987). Moreover, Vygotsky's emphasis on semiotic mediation tends to condense issues of power and control into the study of language alone, without much emphasis placed on practical activity. Therefore, while the first generation of activity theory centres on Vygotsky's notion of mediation, this notion is still located at the level of the individual's actions and does not go far enough to illustrate how cognitive change happens within a collective context. The distinction between individual action and collective activity implied, but not articulated in Vygotsky's theory, was elaborated by one of his colleagues, Alexei Leontiev, whose famous example of the 'primeval collective hunt' clarified the distinction between individual action and collective activity (1981: 210-213). A.N. Leontiev (1975/78; 1981) built on Vygotsky's original thesis, extending his theory to develop the notion of hierarchical levels of human functioning, accounting for individual actions within social activities4. Leontiev's hierarchical model of functioning (see Figure 3) conceives of activity as driven by the object, while individual actions are directed at goals (Engeström, 1987; Leontiev, 1981). In this formulation, Leontiev is able to illustrate how motives, emotions and creativity are social endeavours, something that is quite tricky to do with Vygotsky's triadic model. In his example of the primeval hunt, Leontiev demonstrates the weaknesses inherent in focusing only on tool-mediated, individual actions as a unit of analysis. This example of the primeval hunt has been used by theorists, such as Engeström (1987) to suggest that Leontiev draws a distinction between individual actions and collective activities. Kaptelinin (2005), however, argues that it is probably more in keeping with Leontiev's notion of activity to view this as an example that illustrates ' that dissociation between individual's activities and actions, that is, between motives and goals, initially emerges as a result of division of labour in collective activities'5 (12). And indeed, in the above quotation it is clear that the 'individual's activity' is always social, although not necessarily collective. The object of activity for Leontiev, then, is not collectively shared; the object of activity is individual and it is '[the] true motive. It is understood that the motive may be either material or ideal, either present in perception or existing only in the imagination or thought' (1975/78: 62). For Leontiev studying the object of an activity, then, is primarily about understanding what motivates the actors. While accounting for hierarchical levels of human functioning, Leontiev's theory does not go far enough to situate human functioning in context, illustrating how individual actions are transformed into shared, collective objects through interactions with community members or indeed how division of labour impacts on individual actions in a collective activity. This is where Engeström's (1987) conceptualisation of an activity system (see figure 1) as the basic unit of analysis serves as a useful heuristic for situating cognition in context. While accepting Leontiev's hierarchical levels of human functioning, Engeström moves the theory forward by situating it more fully in context and focusing on the collective nature of all activity. However, while doing this, Engeström shifts the understanding of 'object' to encompass more than mere motive (Kaptelinin, 2005). And it is in this move that confusion surrounding the notion of object begins to rear its head. True motive, raw material, or both? Time and space constraints militate against an in-depth comparison between Engeström and Leontiev's respective theories. Suffice to say that there is much in their work that is similar, and yet, some crucial elements, such as their understanding of the notion of object, differ. I do not propose to engage in an exhaustive discussion regarding the roots of the differences in these theorists' understanding of the object; this paper seeks merely to highlight the different understandings both theorists have towards the object before arguing for which theorists' articulation might work best in an educational setting. 'Human psychology is concerned with the activity of concrete individuals that takes place either in conditions of open association, in the midst of people, or eye-to-eye with the surrounding object world – before the potter's wheel or behind the writing desk. Under whatever kind of conditions and forms human activity takes place, whatever kind of structure it assumes, it must not be considered as isolated from social relations, from the life of society' (1978: 51). For Leontiev then, all activities are social, even those carried out in apparent isolation; however, the focus is on 'concrete individuals' engaged in individual activity. Leontiev's work does not discount the possibility of collective activity; indeed, Engeström (1987) makes a good case for reading his work as a move towards collective activity. It appears, however, that his framework was designed for explicating individuals' activities. Given the profoundly psychological focus of Leontiev's concept of activity as essentially individually motivated, this understanding of activity could not easily be applied to fields outside of psychology that deal with supra-individual activities (Kaptelinin, 2005). Education is a field that deals very much with collective rather than individual activity. As a field of study, education requires that one is able to situate the subject of study within a wider context6, highlighting community membership, rules of interaction and issues related to division of labour in order to more fully understand the complexities of learning and teaching. Consequently, in an attempt to understand the object of this complex activity, I rely on Engeström's elaboration of the activity system as the basic unit of analysis (see figure 1) and it is his understanding of the collective nature of the object that informs my work. 'Objects do not exist for us in themselves, directly and without mediation. We relate to objects by means of other objects ... this means that objects appear in two fundamentally different roles: as objects (Gegenstand) and as mediating artefacts or tools. There is nothing in the material makeup of an object as such that would determine which one it is: object or tool. The constellation of the activity determines the place and meaning of the object' (1996: 361-362). This understanding of the object draws heavily on the Marxian notion that the object of thought (Gegenstand) cannot be understood independently from object oriented practical activity (Objekt) (Marx & Engels, 1970; Roth, 2004). Whereas for Leontiev the object of activity is related to motive, the object of activity, for Engeström, is related to production. However, while focusing on the collectively shared object, Engeström does not dismiss the notion of the object as related to motive but, rather, illustrates the complexities involved in the motivational aspects of collective activity (Hyysalo, 2005). By highlighting the dual7 nature of the object as both material and ideal, what emerges is a notion of the object as containing within it both the 'what' and the 'why' of the activity. It is Engeström's notion of the object as raw material that is acted on during an activity that informs this study. Below, I outline a methodology for investigating the object of an activity as it emerges during an activity. The study underpinning this article investigated how teachers use computers to mediate mathematics and whether the introduction of this novel technology impacts on their pedagogical practices. The focus of the study, then, is on teachers rather than on students. Through detailed analyses of teachers teaching, interviews with teachers and students, classroom observations and analysis of students' productions (such as workbook or board work), the study set out to investigate the potential developmental impact of novel technology by focusing specifically on teachers' pedagogical practices. An exploratory case study design was employed in order to best investigate how teachers appropriate novel technology. The sample comprised four previously disadvantaged primary schools in the Western Cape region of South Africa. In total 153 Grade Six students and four Grade Six mathematics teachers participated in the study. The decision to focus the analytical lens on mathematics classrooms was driven both by the crisis faced in mathematics education in South Africa as well as by the more pragmatic concern with situating the study within a context where computers were used with some frequency (at least once a week for at least one hour). Two schools were located in urban areas and two were located in rural farming districts. All schools can best be described as previously disadvantaged schools that have benefited from a government initiative to bridge the digital divide by providing schools with a fully-equipped computer laboratory (Hardman, 2004). Sixteen lessons differing in length from one hour to one hour and 45 minutes were video recorded and serve as the primary observational data set. The video data were examined for evidence of evaluative episodes, disruptions in the pedagogical script where the teacher makes visible the evaluative criteria required for students to produce a legitimate text. Drawing on Engeström's work (1987), the unit of analysis employed in the study upon which this paper draws is the activity system of the lesson. As noted, a substantial amount of research using AT in educational settings is driven by interventionist concerns. 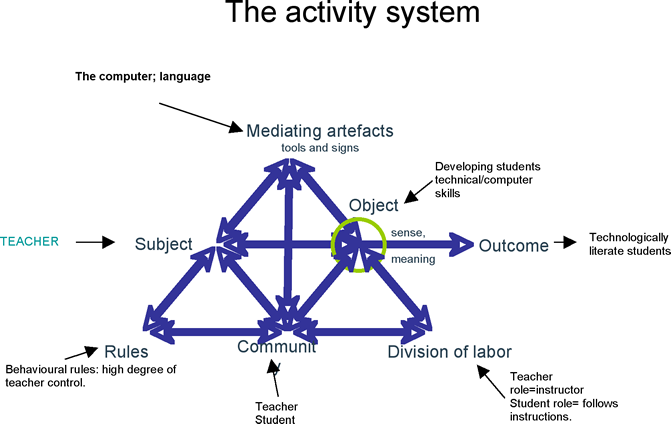 For Daniels (2005) three steps are necessary in the interventionist use of activity theory8 in order to understand the object of the activity system. First, one interviews the participants9 (in this study, the teachers) in order to elicit motives; second, one uses observations to study what is really being worked on and thirdly, one takes the data back to the teachers in order to surface contradictions between the intended and actual practice. These contradictions in turn drive transformation. As the nature of my own work is located in an exploratory case study rather than in an interventionist mould, I have not used activity theory in order to intervene and transform practice. Rather, for my purposes, the theory serves as a useful framework for situating practice in context and for interrogating how teachers appropriate a novel tool. To this end I have developed a method capable of tracking the emergence of the object by focusing on moments in the pedagogical script where the student productions challenge the invisible boundaries in the script forcing the teacher to restate the criteria for successful production of a legitimate text. It is in the restatement of these criteria that the object, that problem space that the teacher and students work on together, becomes visible. An evaluative episode is a coherent classroom activity in which the teacher elaborates the evaluative criteria required to produce a legitimate script. These episodes are marked out because they represent disruptions in the pedagogical script; that is, they indicate a break in the flow of the script where the teacher is called on to restate the requisite evaluative criteria in response to student productions. Essentially, these are spaces in which the teacher realises that the students' have not yet acquired the requisite rules for the production of a legitimate text and, consequently, the teacher restates these rules; these are spaces, then, of clarification and illustration arising out of students' mis/lack of understanding10. 'chunk of the object handled and moulded by the subject at a time...Once identified the object-unit thus provides a strategic lens or magnifying glass through which the inner movement of the activity system becomes visible'. While pointing to the importance of being able to identify the object, Engeström does not, as far as I can determine, provide a methodology for achieving this in relation to observational data. It is this gap in AT's current methodological tool box that I seek to engage with in this paper. The data were analysed at two stages. In the first stage, evaluative episodes were identified. That is, transcribed lessons were analysed with the purpose of identifying disruptions in the pedagogical script that led teachers to restate the criteria for producing a valid text. The episodes were then coded using categories suggested by AT: viz, object, subject, community, division of labour, rules and tools. For the purpose of analysing classroom discourse, this discourse was broken up into teacher and student utterances. As the focus of this study is on teachers' pedagogic practice, I focus here primarily on teachers' utterances. Utterances were divided into two groups: questions and statements. Some questions were difficult to categorise as such as they did not elicit answers nor were intended to do so (such as a rhetorical question that the teacher might answer him/herself). These questions where no responses were elicited were categorised as statements (Myhill & Duncan, 2005). Statements were categorised as those utterances that did not elicit a response. Tables 1.1 and 1.2. elaborate the utterances categorised in this study. Teacher: What is 3 x 1? Teacher: How did you work that out? Teacher: Can you all hear? Teacher: My denominator tells me how many parts I have divided my whole into. Instruction regarding skills required to complete task. Teacher: You fold the paper into four. In the top corner you put mixed numbers. Instruction regarding how to use a computer-technical skill. Teacher: I click here and then text wrap. Teacher: Now, what is this? Teacher controls time in which tasks are carried out – overt verbal instructions to hurry up. Teacher: Hurry up! Time is short. Teacher verbally instructs students in how to behave appropriately. Teacher: Don't shout out! You put up your hand [if you want to answer a question]! Evaluative episodes represent disruptions in the pedagogic script where the teacher restates the evaluative criteria required to produce a legitimate text. By focusing on developing students' understanding of these evaluative rules, evaluative episodes make visible the object of the lesson because they capture both what the teacher is working on (the problem space being acted on in the lesson) as well as capturing the teacher's motive for acting. These are spaces where the teacher, realising that the students have not yet understood the thrust of the lesson, changes the flow of the lesson in order to restate what the object of the lesson is. A total of 29 evaluative episodes were identified and analysed; 12 of which were computer-based episodes. In table 2 above, one can see that for Merryvale13 and Thandokulu primary schools, six evaluative episodes were recorded in the face-to-face lessons. Both these schools are located in a farming district. In Newtown and Siyazama, two urban primary schools, the picture alters with four episodes recorded in Newtown and only 1 episode recorded in Siyazama. The number of episodes collected in the computer laboratory is slightly lower than those collected in the face-to-face lessons, with four episodes being identified in Merryvale and Newtown and three in Thandokulu. I remind readers here that these episodes provide insight into the object, and hence the activity system, of the overarching lesson. Using the conceptual tools drawn from AT, below I present an analysis of a representative evaluative episode identified in this study. The teacher has been explaining how the students are to proceed with a computer task; he has been elaborating the skills they need in order to accomplish the task. They have spent the lesson drawing shapes such as squares and 'guessing' what half of the square is, drawing a line to represent that half, colouring in the half and then typing in ½ next to the coloured-in square. While a few students seem to have grasped the task it is apparent that most are struggling as they do not have the requisite computer skills. This episode happens 30 minutes into an hour-long lesson. Recognising that the children are not engaging with the task, the teacher is now compelled to restate the criteria. The teacher is standing behind a student, telling her how to manipulate the mouse in order to engage with the task. At one point (line 5) he actually takes the mouse himself and demonstrates how to 'click and drag'. Episode 1: Skills required for manipulating computer programme. Teacher (Mr. M): Come, let me show you again. The students do not appear able to engage in the task. The teacher sits at a computer and the students (about 15 of them) stand behind him while he manipulates the mouse. He talks as he is manipulating the mouse. After showing the students how to do the task, the teacher checks their understanding before showing them the steps again. R2 Rules: Look when teacher talks. Look what I am doing. We go to auto shapes; auto shapes. Shows them again for a further five minutes before moving on to another task. This episode begins with the teacher asking a procedural question (line 7) that functions to check whether students have understood the process he has spent eight minutes elaborating on. When the students do not answer him but look at him instead, he takes this as an opportunity to restate the criteria for successful completion of this task. Now, rather than explaining the process to them only verbally, as he has just done, he sits at a computer surrounded by those children (about half the class; 15 students) who have not understood the instructions and visually and verbally illustrates the process that he has verbally outlined. The teacher uses both talk and the computer to develop students' computer skills in this episode. Most of the teacher's talk (70%14 of the teacher's coded talk) is used to instruct students in how to use the computer. Note that he instructs the children verbally while demonstrating how to do it on the computer (12, 14, 15, 16, 17, 29, 30, 34, 35, 36, 37, 38). That is, the teacher does not merely use talk as a tool to develop students' computer skills, he also uses the computer as a tool for this purpose. Students use talk (3% of all coded talk) to respond to the teacher's questions. The teacher also uses talk (18% of all coded talk) to manage the classroom through setting behavioural rules and managing the pace and which work is covered. The object of an activity is that collectively shared problem space that community members act on and transform during the unfolding activity. What is it that the teacher and students are working on in this episode? It is clear that in this episode the teacher is focused on developing students' computer skills. The group of students standing behind him watching him appear to share in this object, as they have self-selected to watch him perform the task (he has not told them to do so, but has merely offered to demonstrate the skills again). However, the relative silence of the students makes it difficult to infer students' motives for sharing this object; it could just be that they want to please the teacher in this instance. I do, however, think that their self-selection says something about their desire to develop their skills in this area. There is no test on this, nor are they going to be graded on their output. Hence, selecting to watch the teacher restate the skills says something, perhaps, about their desire to develop their computer skills. It is also clear that the teacher's focus is on covering the content in a timeous manner; hence the high degree of control over the pace of this interaction. Division of labour is both vertical and horizontal and refers to the negotiation of responsibilities, tasks and power relations within a classroom. The teacher completely dominates talk time with students only verbally interacting with him once (line 26). There is thus a clear asymmetrical power relation set up between teacher and students in this episode. The teacher demonstrates the computer skills needed to engage with the task. He uses language to instruct students regarding these skills, which are technical in nature. He directs their potential actions by explicitly illustrating and verbalising what they will be required to do. He is, in a sense, the instructor in this episode and the students are the listeners, who must model their behaviour on his if they want to accomplish the task. There is a sense in which this role differs from one of expert and novice in that the type of knowledge being imparted is basic skills and competency, rather than expertise, which requires giving the novice access to tacit rules of engagement. An expert on this understanding is someone who is able to elaborate the evaluative criteria or rules for the production of a legitimate text, in such a way that the student is able to access and use these rules in future problem-solving activities. No fundamental rules of computer usage are being imparted; rather, the skills are based entirely in this one task. That is, these skills are context dependent and not transcendent. There is little in this episode to suggest that the skills he illustrates will ultimately become tools for the students to use in solving similar problems. The teacher is perceived as a didactic instructor. This role is characterised by almost no student interaction, evaluation of students' productions that is not explicit, and a focus on the transmission rather than the acquisition of knowledge. There is actually very little interaction between the teacher and the students: the teacher instructs; the students follow. A central feature of the teacher's role as instructor is that the teacher sets the rules and the students follow them. No students set any rules in this episode. Rules may be either behavioural prescriptions or mathematical in nature. Behavioural rules, such as keeping silent when the teacher talks, may be either explicitly stated or implicitly followed in a classroom context, depending on the extent to which students have internalised behavioural norms. Where behavioural rules are explicit, the control over behaviour lies with the teacher. In this episode, the teacher explicitly states rules, rather than assuming an implicit understanding on the students' behalf. Students are required to watch the teacher carefully (19, 20, 23, 24) as well as to listen to him (32, 33). It is the teacher who exercises control over pace, sequence and selection of content during this episode with students not intervening to question him. The community in this activity system is that group of people who share an object, in this instance, the development of children's technical skills. In this episode, the community comprises the students and the teacher. While a wider community exists outside of the school (such as the Western Cape Education Department, who will also share this object to a greater or lesser degree) I have chosen to focus my analytical lens on only those participants who are obviously involved in this episode. As the teacher makes no use of textbooks or worksheets in this episode, I have also excluded curriculum specialists from the community of this particular episode. This is not to ignore the obvious impact the wider community has on the teacher's decisions regarding what object is to be worked on. However, this influence cannot be garnered from this episode. Analysis of this evaluative episode enables us to graphically represent the activity system of the episode, as in figure 4. In figure 4, we can see that the teacher, acting in the role of instructor, uses various tools to develop students' technical skills (object), producing technologically literate students (outcome) in a context in which the teacher exercises a high degree of control over behavioural rules. The production of 'technologically literate students' is the actual outcome of this episode, rather than the intended outcome. As this is a computer-based mathematics episode, the teacher's intended15 object of the episode is the development of students' mathematical understanding and, hence the production of mathematically literate students. This paper began with two questions: one relates to how a researcher can methodologically track the object of classroom activity and the second, related question, was whether this methodology would enable one to construct a model of the activity system of a computer -based mathematics lesson. Activity theory is a developing body of knowledge, in which ideas and concepts continue to be debated and empirically tested. One of the most conceptually contested areas of AT is its notion of the 'object' of activity. The interventionist use of AT as a theory capable of articulating and driving change currently dominates the literature. In this paper, I have argued for the use of AT as a tool for analysing observational data at the level of the classroom by elaborating the notion of evaluative episodes as those pedagogical moments in which the previously invisible rules of engagement are made visible, which in turn, surfaces the object of acquisition. Findings indicate that evaluative episodes provide a window into the unfolding activity system of the classroom, a microcosm if you will, of the overall system. By enabling the researcher to temporarily freeze the unfolding system, evaluative episodes allow us to construct a model of activity in the computer-based mathematics lesson, illustrating how a tightening of the rules in the computer lesson mediates the teacher's selection of tools (in this case a reliance on talk and the computer) which in turn impacts on the kind of object the teacher acts on in this lesson (children's technical skills). The rather rigid role of instructor, characterised by asymmetrical power relations, played out by the teacher in turn mediates the students' and teacher's interaction with the object of the activity. 1 The international average score for 38 countries was 487 points; South Africa achieved a total of 275 points. 2 An extensive, although arguably not exhaustive, search of the ERIC database, a broad journal search as well as a Google Scholar search uncovered Lim's (2001; 2003) work where he explicitly uses AT to analyse classroom observations as part of a wider project. This is the only study I have found that makes explicit use of AT to analyse observational data at the level of the classroom. 3 "Every function in the child's cultural development appears twice: first, on the social level, and later on the individual level; first, between people (interpsychological), and then inside the child (intrapsychological). This applies equally to voluntary attention, to logical memory, and to the formulation of concepts. All the higher functions originate as actual relations between human individuals (Vygotsky, 1978:57). This law famously overcomes the nature/nurture debate by situating mind in society. 4 While Leontiev did indeed extend a portion of Vygotsky's theory, his endeavours differed in significant ways from Vygotsky's project. This is especially so in relation to the notion of semiotic mediation. For Leontiev, semiotic mediation is not central to development; practical activity rather than signs and symbols mediate cognitive development (Kozulin, 1986). 5 I recognise that the primeval hunt can indeed be interpreted as Engeström does, i.e. as an indication that actions are individual while activities are collective. However, on my reading of Leontiev's (1981) work I am inclined to agree with Kaptelinin that his psychological bias seems always to point to the individual. Activities are carried out by individuals, either individually or collectively, who are animated in the activity by the object (the motive that drives them to act). For a well-argued but different view, I refer readers to Engeström (1987). 6 There is some conceptual fuzziness surrounding the notion of 'context' as it arises out of debates that stretch across sociology, anthropology and cultural psychology (Cole, 1996). For my purposes I draw on Cole's (1996) notion of context as that which 'weaves together'. Interested readers are referred to this seminal work in cultural psychology for an in-depth discussion in which Cole illustrates how the notion of context is elegantly captured in Engeström's elaboration of an activity system. 7 For Illyenkov, who draws on Hegel and Marx, an artefact's ideality results from the 'transforming, form-creating, activity of social beings, their aim mediated, sensuously objective activity' (Bakhurst, 1991: 182). There is, therefore, no way of telling whether something is an artefact or an object outside of the particular context of activity. 8 The interventionist use of activity theory plays itself out in Change Laboratories or Developmental Work Research (see for example Engeström, 2005, Daniels et al, 2005). 9 See Hardman, 2005b for a detailed discussion of the interview process. 10 Note, however, that in severely dysfunctional classes, one may not be able to find evaluative episodes as these episodes indicate a level of teacher responsivity that would be lacking in a context where the teacher's main function was to manage behaviour and the students' main function was to rote learn (for an example of dysfunctional classrooms, see Hoadley, 2005; Jacklin, 2005). 11 For Bernstein (1975), 'framing refers to the degree of control teacher and pupil possess over the selection, sequencing, pacing and evaluation of the knowledge transmitted and received in the pedagogical relationship' (88). 12 Pseudonyms are used when referring to schools who participated in this study. 13 All names, both individual and school names, are pseudonyms. 14 Determined by coding the teachers' discourse, counting instances of a category and generating a frequency count. 15 This is a fairly typical lesson. I want them to really understand fractions, so that's what it's about. Getting them to understand.' (Interview: Mr Botha, August, 2003). Bakhurst, D. (1987) Consciousness and Revolution in Soviet Philosophy: the Bolsheviks to Evald Ilyenkov. Cambridge: Cambridge University Press. Bernstein, B. (1996) Pedagogizing Knowledge. In Pedagogy, Symbolic Control and Identity: Theory, Research, Critique. London: Taylor & Francis. Brostrom, S. (1999) Drama games with six-year-old children: Possibilities and limitations. In Engeström, Y.; Miettinen, R. & Punamaki, R-L. (Eds.) Perspectives on activity theory (250-264). Cambridge: Cambridge University Press. Campbell, P.F. ; Fein, G.G. & Schwartz, S.S. (1991) The effects of Logo experience on first grade children's ability to estimate distance. Journal of Educational Computing Research, 7(3), 331-349. Cazden, C.B. (1986) Classroom Discourse. In Wittrock (Ed): Handbook of Research on Teaching. A project of the American Educational Research Association, (432-463). New York: Macmillan. Cole, M. & Engeström, Y. (1993) A cultural-historical approach to distributed cognition. In Saloman, G. (Ed.) Distributed cognition: psychological and educational considerations. Cambridge: Cambridge University Press. Cole, M. (1996) Cultural Psychology: a once and future discipline. Cambridge MA: Harvard University Press. Cuban, L. (1982) Persistent instruction: the high school classroom 1900-1980. Phi Delta Kappan, 64(2), 113-118. Daniels, H. & Leadbetter, J. (2005) Learning in and for interschool working to promote creativity. Presented at the 1st International ISCAR conference: Seville, Spain, 20-25 September. Davydov, V. V. (1982) The psychological structure and contents of the learning activity in school children. In Glaser, R. & Lompscher, J. (Eds.) Cognitive and motivational aspects of instruction. Berlin: Deutscher Verlag der Wissenschaften. Davydov, V.V. & Markova, A.A. (1983) A concept of educational activity for school children. Soviet Psychology, 2(2), 50-76. Department of Education. (1996) Technology- Enhanced Learning in South Africa: A Discussion Document: Report of the Ministerial Committee for Development Work on the role of Technology that will support and enhance learning. Department of Education: Pretoria. Department of Education. (2000) Curriculum 2005: Towards a theoretical framework. Pretoria. Department of Education. (2002) Revised National Curriculum Statement Grades R-9 (Schools) Policy: Overview, Gazette No.23406: 443: 20 - 21. Department of Education: Pretoria. Dewey, J. (1938) The determination of ultimate values or aims through antecedent or a priori speculation or through pragmatic or empirical enquiry. In. Whipple, G. (Ed.) The twenty-seventh yearbook of the National Society for the Study of Education. Bloomington: Public School Publishing. Engeström, Y. (1987) Learning by expanding an activity -theoretic approach to developmental research. Helsinki: Orienta-Konsultit Oy. Engeström, Y. (1990) Learning, working and imagining twelve studies in activity theory. Helsinki: Orienta-Konsultit Oy. Engeström, Y. (1991) Non scolae sed vitae discimus: toward overcoming the encapsulation of school learning. Learning and Instruction, 1, 243-59. Engeström, Y & Escalante, V. (1996) Mundane tool or object of affection? The rise and fall of the postal buddy. In Nardi, B. (Ed.) Context and consciousness: Activity theory and human-computer interaction. Cambridge, MA: MIT Press. Engeström, Y. (2005) Developmental Work Research - Expanding activity theory in Practice. Berlin: Lehmans Media. Ensor, M.P. & Hoadley, U.K. (2004) Developing languages of description to research pedagogy. Journal of Education, 32, 81-104. Fey, J.T. (1984) Computing and mathematics: the impact on secondary school curricula. Reston: National Council of Teachers of Mathematics. Fichtner, B. (1984) Learning and learning activity – two different types of learning in school and the historical societal contexts of their development. In Bol, E.; Haenen, J.P.P. & Wolters, M.A. (Eds.) Education for cognitive development. Den Haag: SVO. Foot, K. (2002) Pursuing an evolving object: a case study in object formation and identification. Mind, Culture and Activity, 9(2), 132-149. Hardman, J. (2004) How do teachers use computers to teach mathematics? Khanya project report: 1-26 (unpublished). Hardman, J. ( 2005) Activity theory as a potential framework for technology research in an unequal terrain. South African Journal of Higher Education, 19(2), 258-265. Hardman, J. (2007a) Towards a methodology for using Activity Theory to explicate the pedagogical object in a primary school mathematics classroom. Outlines 1:53-69. Hedegaard, M. (1998) Situated learning and cognition: theoretical learning and cognition. Mind, Culture and Activity, 5(2), 114-126. Hoadley, U. (2002) An analysis of transmission in four grade one classrooms. Paper distributed at the Kenton Education Association Conference, Salt Rock. Holmes, B.; Savage, T. & Tangney, B. (2000) Innovation in Learning in the Information Society: A Comparative International Study. Dublin: Trinity College. Hyysalo, S. (2005) Objects and Motives in a Product Design Process. Mind, Culture and Activity, 12(1), 19-35. Jacklin, H. (2005) Repetition and Difference: A rhythymanalysis of pedagogic practice. Unpublished Doctoral thesis: UCT: Cape Town. Kaptelinin, V. (2005) The object of activity: making sense of the sense-maker. Mind, Culture and Activity, 12(1), 4-18. Leontiev, A. N. (1978) Activity, consciousness, and personality. Englewood Cliffs, NJ: Prentice-Hall. Leontiev, A.N. (1981) The problem of activity in psychology. In Wertsch, J.V. (Ed.) The concept of activity in Soviet psychology. Armonk, N.Y.: M.E. Sharpe. Lim, C.P. & Chai, C.S. (2004) An activity theoretical approach to research of ICT integration in Singapore schools: Orienting activities and learner autonomy. Computers and education, 43(1), 215-236. Lim, C.P. & Hang, D. (2003) An activity theory approach to research of ICT integration in Singapore schools. Computers & Education 41, 49-63. Lim, C.P. (2001) Object of the activity systems as a major barrier to the creative use of ICT in schools. Australian Journal of Educational Technology. 17(3), 295-312. Lundgren, U. (1979) Att organisera omvarlden. Introduction till laroplansteori. Stockholm: Liber. Lyotard, J-F. (1984) The Postmodern Condition: A Report on Knowledge, Minneapolis: University of Minnesota Press. Martin, J. (2000) TIMSS 1999 International Science Report: Findings from IEA's Repeat of the Third International Mathematics and Science Study at the Eighth Grade. Exhibit 1.1. Chestnut Hill, MA, Boston College. Marx, K. & Engels, F. (1970) The German Ideology. In Arthur , C.J. (Ed. ); Lough, W.; Dun, C. & Magill, C.P. (trans.) New York: International. Miettinen, R. (1999) Transcending traditional school learning. In Engeström, Y.; Miettinen, R. & Punamaki, R-L. (Eds.) Perspectives in activity theory. Cambridge: Cambridge University Press. Morais, Neves & Pires, (2004) The what and the how of teaching and learning: going deeper into sociological analysis and intervention. In Muller,J. ; Davies, B. & Morais, A. (Eds.) Thinking with Bernstein, working with Bernstein. London: Routledge. Nardi, B. (Ed.) (1996) Context and consciousness: Activity theory and human-computer interaction. Cambridge, MA: MIT Press. Mercer, N. & Wegerif, R. (1998) Is 'exploratory talk' productive talk? In Littleton, K. & Light, P. (Eds.) Learning with computers: analysing productive interactions. London: Routledge. Papert, S. (1980) Mindstorms: Children, computers and powerful ideas. New York: Basic Books Inc.
Papert, S. (1990) Software design as a learning environment. Interactive Learning Environments 1(1), 1-32. Roth, W-M. (2004) Activity theory and Education: An introduction. Mind, Culture and Activity. 11(1), 1-8. Russell, D. (2002) Looking beyond the interface: Activity theory and distributed learning. Lea, M. & Nicoll, K. (Eds.) Distributed Learning. London: RoutledgeFalmer. Russell, D.L. & Schneiderheinze, A. (2005) Understanding innovation in education using activity theory. Educational Technology and society. 8(1), 38-53. Schatzki, T.R. (1995) Objectivity and rationality. In Natter, W.; Schatzki, T.R. & Jones, J.P.(Eds.) Objectivity and its other. New York: Guilford. Seitamaa-Hakkarainen, P.; Hakkarainen, K.; Bollstrom-Huttunen, M. & Engeström, R.(2005) Practices of Teacher Guidance in the computer supported collaborative learning. Presented at the 1st International ISCAR conference: Seville, Spain, 20-25 September. Sivin-Kachala, J. (1998) Report on the Effectiveness of Technology in Schools, 1990-1997. New York: Software Publisher's Association. Taylor, N. & Vinjevold, P. (Eds.) (1999) Getting learning right. Johannesburg, Joint Education Trust. Taylor, N, Muller, J. & Vinjevold, P. (2003) Getting schools working; research and systemic school reform in South Africa. Cape Town: Pearson Education. Thomas, R.M. (1998) Conducting Educational Research: A comparative view. Westport: Bergin & Garvey. Wegerif, N.; Mercer, N. & Dawes, L. (1999) From social interaction to individual reasoning: an empirical investigation of a possible socio-cultural model of cognitive development. Learning and Instruction, 9(6), 493-516. Wegerif, R. & Scrimshaw, P. (1997) ''Introduction: Computers, Talk and Learning'. In Wegerif, R. & Scrimshaw, P. (Eds.) Computers and Talk in the Primary Classroom. Clevedon: Multilingual Matters. Vygotsky, L. S. (1978) Mind in society; The development of higher psychological processes. Cole, M.; John-Steiner, V.; Scribner, S. & Souberman, S. (Eds and trans.) Cambridge: MA, Harvard University Press.